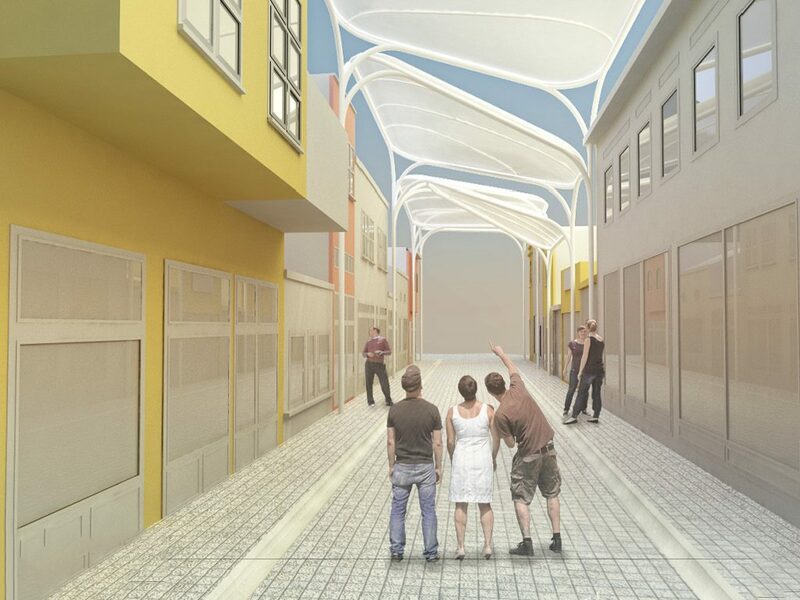 The shading structure covers a street in an open air bazaar (çarşı) in Eskişehir. Open air bazaars are a very common and traditional built environment in Turkish cities which has been the heart of the commerce of the city before the modern shopping malls arrived. The bazaar area has been fallen to neglect in the last decades and rapidly losing customers to the newly built shopping mall in the near vicinity. 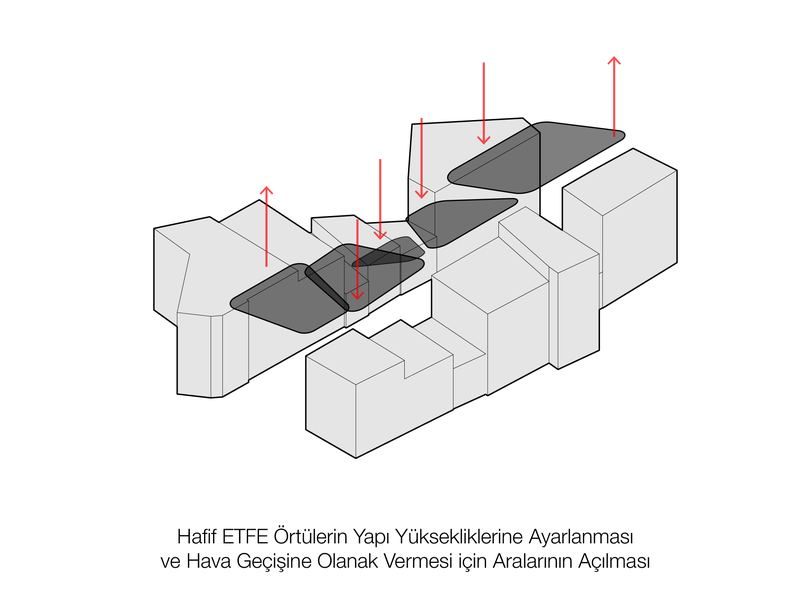 The Municipality of Odunpazarı has conceived the project as a prototype to be applied to the rest of the bazaar area as the continental city of Eskişehir at the heartland of Anatolia is known for its harsh climatic conditions, assuming improved climatic conditions would improve the user experience and attract new users to the area. 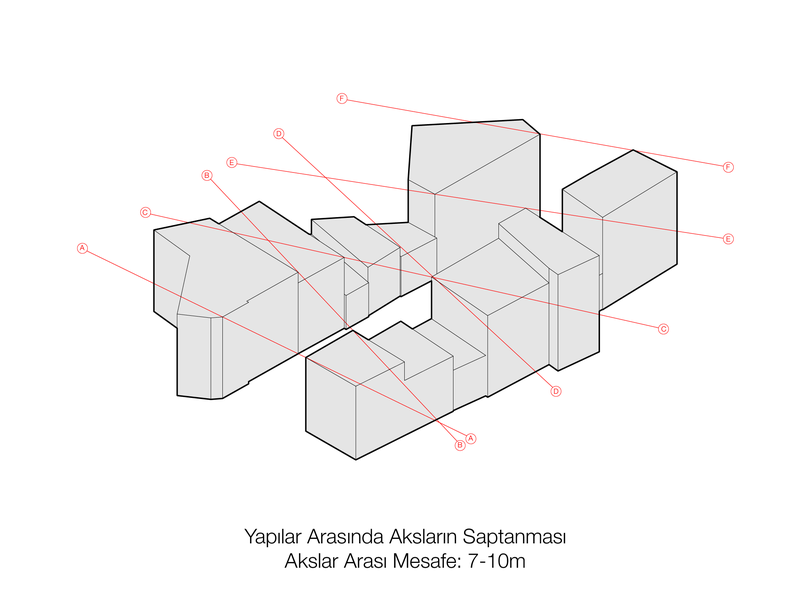 Due to uncontrolled development in the past, all buildings facing the Yandaş Street has different awning heights and many added floors. 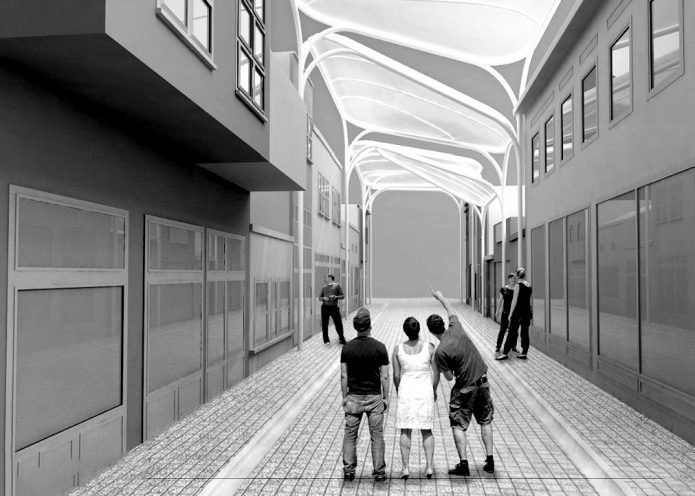 The shading structure had to adapt to this extreme height variations while providing enough flexibility to allow for optimizing the climatic conditions at street level. 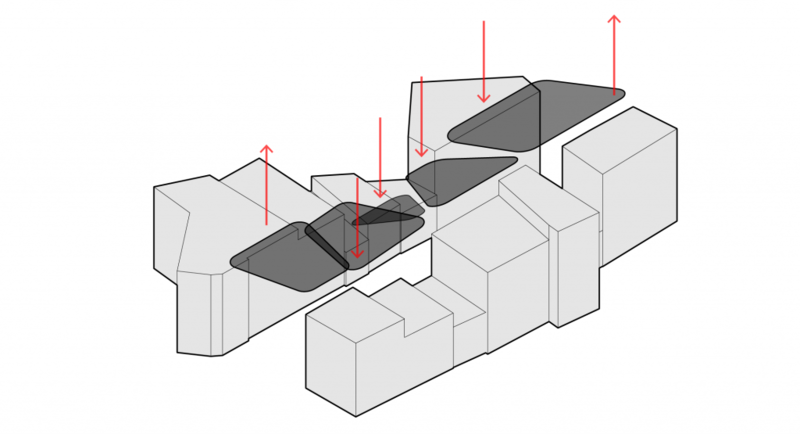 The modularity of the design provides wind through the street, allowing natural ventilation through the openings compensating the height differences. The sizes of the modules have been decided based on the building edges to not obstruct the view of the facades and shop displays. The street lighting has been embedded in the structure to remove obstructive lighting elements and to provide indirect lighting. The division and height of the structure have been optimized to allow minimal solar radiation to shop windows in the summer to avoid glare and colour degradation to merchandise displayed on the store fronts while allowing for maximum solar radiation to street level in winter to avoid frost and help with the physiological equivalent temperature. 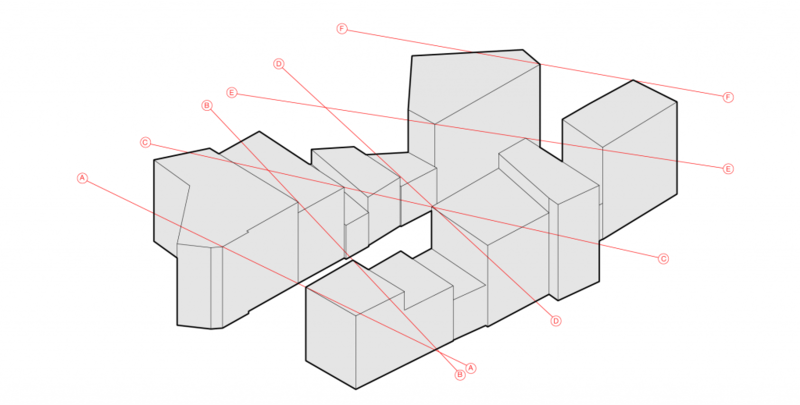 A custom Grasshopper script allows for the manipulation of the height of each module. The variable height has been connected to the Octopus Genetic Solver to provide a 2-dimensional graph showing the correlation between the summer/winter and shop window/street level condition. Final geometry was simulated for winter and summer conditions in Ecotect and Radiance, in order to make sure the values were within accepted range. 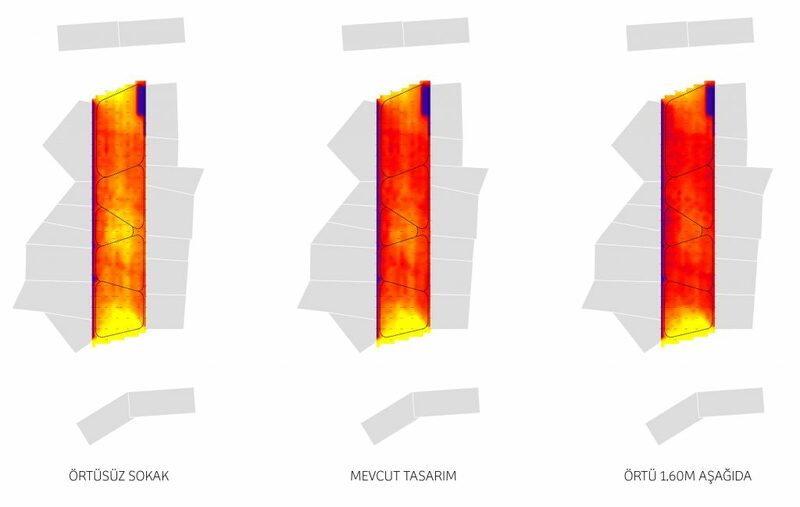 Determining the axes between existing buildings. 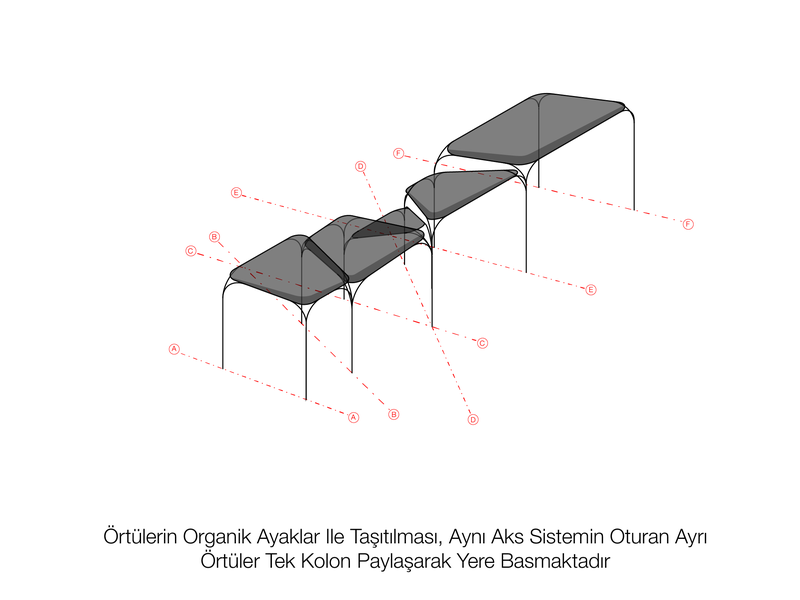 The shades are supported on steel structures, situated on the axes. Semi-transparent ETFE panels allow for daylight provision while limiting solar radiation. The panels are shifted up and down to allow for natural air circulation. The solar radiation levels on the ground floor were controlled for several panel heights, in order to make sure there will be no frosting on the street during winter.